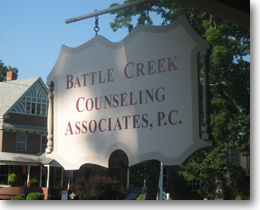 Since 2000, Battle Creek Counseling Associates, PC offers a broad range of psychological and counseling services. Our therapists include licensed psychologists, limited licensed psychologists, licensed professional counselors, and licensed clinical social workers. We provide individual, family, and group psychotherapy, as well as diagnostic services. We also provide psychological forensic and neuropsychological evaluations. Our therapists and support staff are dedicated to providing professional, high quality counseling services in a friendly, relaxed atmosphere. We are committed in helping our community to the best of our ability and hope to hear from you soon.